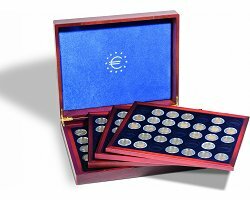 High-quality presentation case in premium mahogany-stained wood grain finish for 140 2-euro coins in capsules (inner Ø 26 mm). 4 trays with blue, velour-like surface and 35 round cavities each (Ø 32 mm). Especially sturdy inlays through wood framing. Premium printing on lid and cushion. Lid cushion upholstered in blue satin. Secure and unobtrusive magnetic fastener. Overall size: 330 x 70 x 270 mm (13 x 2 3/4 x 10 5/8 x").